2.1 What is a Physiopedia Educational Project? 4.1 What have I learned through this internship? 5.2.1 But what is an Educational project? 5.2.2 What do we expect from teachers, students and the universities involved? The following page is the Educational Projects Internship Report from the intern Carlos Areia as part of his Educational Projects Assistant role between July-September 2014. Is is important to note that some of the statements used in this report are my opinions regarding to the findings through the internship and are not linked to any kind of scientific background or research. What is a Physiopedia Educational Project? An Educational project, allows teachers to involve their students in Physiopedia, by completing their assignments within our website; for instance, the student instead of delivering the work on a traditional format to the educator (paper, word or pdf file) creates a new page or updates an old one inside Physiopedia and gets evaluated in the same way. initial peer publication and review for clinical instructors. Physiopedia provides a means for early-career professional publication. What pages are available to support educators and students taking part on Educational Projects? This page will give Educators an idea of what kind of projects can be done within Physiopedia, and how the Educator can interact with them. Once the Educator have decided to use Physiopedia in their class this page guides him toward a step by step guide. Firstly teaches the educators how to get started in Physiopedia, how to create their account familiarizing with editing; and afterwards how to get their students familiar with Physiopedia too and instruct them what to do, among others. In this link its possible to find a series of tutorial pages providing simple guides to the most common activities of Physiopedia readers and authors. Please note that these tutorials are in development. Tutorials and help in each project, for example other similar pages and created in previous projects. Everyone in Physiopedia helps, just give us a touch. During the orientation, wikipedia guides the educators through their learning step by step and teaches them not only how to fully use and enjoy wikipedia features but also how to teach and guide their students to work inside wikipedia. Wikipedia also provides to the educator material (online brochures, among others) so they can give to their students to help them learning how to work with this website. Every month wikipedia provides a “This Month in Education” Newletter. Wikiversity is a Wikimedia Foundation project devoted to learning resources, learning projects, and research for use in all levels, types, and styles of education from pre-school to university, including professional training and informal learning. They invite teachers, students, and researchers to join them in creating open educational resources and collaborative learning communities. A project is a collection of pages: this is one of the fundamental differences between Wikiversity and Wikipedia. Wikipedia's articles are single-page entities. Wikiversity's learning projects are multi-page entities. There is good reason for this: they have found that when people create educational resources, a single page simply doesn't work. Wikiversity deals with multi-page entities (projects), because this is what its educational mission requires. a. Multi-page content projects: both wiki and physiopedia work in their educational projects to complete and create various pages regarding a theme, multi-pages resources. In my opinion i think that the wikipedia organization is better than Physiopedia’s, to be honest, there is plenty of content that is hard to find inside Physiopedia (but neverthless it’s there). Wikipedia is a little bit tidied up and plenty of their educational projects are related to that, almost everything in a theme/subject can be linked so valuable content dont’t be lost; for instance university and student work regarding a theme can be linked in both wikiversity and wikipedia page (as well as other valuable links like videos, more projects, facts and interests). This means a lot of work but in that way we don’t lose any content created by students. This is the point that i think Physiopedia is better than wikipedia. Sure that there are pages in wikipedia that have a wide range of updated references and content, however there are many pages that lack of references (or at least good and reliable ones). 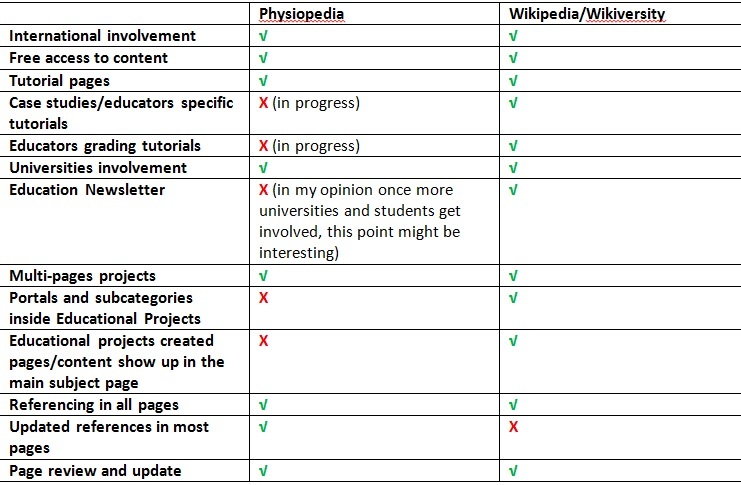 This depends of course on the page creator but Physiopedia has a more regular kind of referencing (which is normal, regarding that we are all Physios, unlike wikipedia where are very different areas with different kinds of referencing (i think)). Physiopedia is more strict in this point, wikipedia is more about quantity and Physiopedia more about the quality of the references (in a average analysis of the pages of course). What have I learned through this internship? The Educational Projects Assistant Internship was once an insightful experience. I have learnt that Physiopedia is more than just a website; it is more a Physiotherapy community where everybody shares their knowledge and thoughts, all around the world. And that is simply amazing. I have also learned how to effectively conduct an educational project, create and review wiki pages, among many other useful things. The “Educational Projects” project is a great idea to expand the site and increase this community with new and young members/students as well as theirs educators and the university. It is important that everyone accesses the latest reviewed information; specially students, that need to learn what is now the “gold-standard” Physiotherapy, what methods and treatments are effective and what is more used and why it is used. These are questions that can be answered in Physiopedia, but there is much more that the Physio worldwide community can do; and in my opinion Educational Projects are the way to do it. Why should a students work be lost in the teacher drawer? In this way their work can get exposed, used and corrected not only by the teacher but by everyone; and if every Physiotherapy university starts to work in a wiki based works, not only Physiopedia content grows but also the university, that gets their students work published and know by this community; which is also great for the teacher and students. All the support is provided from Physiopedia staff to everyone, and there are no fees or payments needed to contribute and access this valuable information. On the other hand in my opinion Physiopedia site loses some valuable information created through Educational Projects, I think we should learn from Wikipedia and wikiversity in that point, there is many information and external links attached to the page. Maybe it is a good idea to create some automatic boxes that link pages through theme (it is just an idea); other point that I find important inside Physiopedia website is a little bit confusing and pages show too much information, for instance http://www.physio-pedia.com/Special:Categories and http://www.physio-pedia.com/Articles; and with the increasing of Universities adhering to Educational projects and consequently the creation of more pages I honestly think that it is time to tidy up these pages a bit (like create categories-subcategories). Physiopedia is a worldwide Physiotherapy wiki based site (similar to Wikipedia, but specialized in our profession), our aim is to give access to the latest and updated Physio information to practitioners, students, teachers, carers and everyone interested in this subject. Although relatively recent, this website has grown through the years and we want to get Physiotherapy universities involved all around the world in this community. Therefore Physiopedia as created the “Educational Projects”, there are currently universities already working with us through these projects but it is our goal to gradually increase, grow and recruit more universities. But what is an Educational project? An Educational project, allows teachers to involve their students in Physiopedia, by completing their assignments within our website; for instance, the student instead of delivering the work on a traditional format to the educator (paper, word or pdf file) creates a new page or updates an old one inside Physiopedia and gets evaluated in the same way. They can also perform other activities, like presentations, videos and others. What do we expect from teachers, students and the universities involved? There is no cost in developing and participating in this worldwide community, we only seek to develop the website so we can give quality information to everyone and grow our content either quantitative and qualitatively. -Share your opinion/critic on a Physiotherapy book/journal/article, etc…. In my opinion this internship was very important not only in my professional but also in my personal development, I think that Educational Projects is a new and original project that every university should be involved because it can not only benefit the students and teachers directly involved but also the University Physiotherapy Department/School. It is also important for Physiopedia that everyone contributes so the updated and rigorous literature is always available in this worldwide physiotherapy website. Looking at the future I think that these projects are going to get gradually more and more adherence, and one day most universities are going to share their works inside Physiopedia. It is time to change Education methodologies and share your valuable work online. I want to thank Rachael Lowe for the opportunity of this internship and her great support through it. I also want to say thank you for the whole Physiopedia community for their valuable efforts and work in developing this great website; every day Physiopedia is growing thanks to everyone involved.